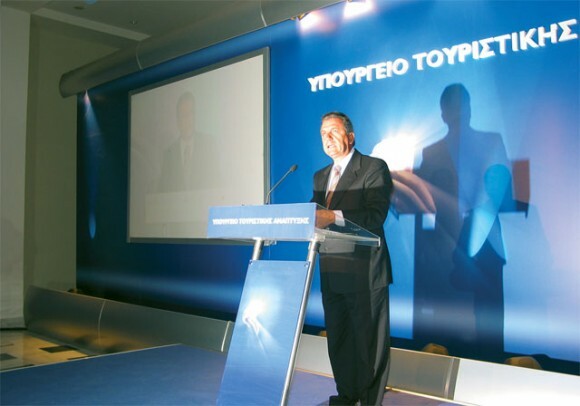 Tourism Minister Dimitris Avramopoulos in the ministry’s tourism presentation room at Zappeio announces new tourism promotion campaign ideas. Tourism Minister Dimitris Avramopoulos called Greece’s tourism leaders to a double launch and a reception last month at Zappeio Hall. The minister presented tourism promotion plans for after the Athens 2004 Olympic Games, and the new tourism exhibition stands within Zappeio (Olympic press center) created especially for officials and journalists here for the Games. The minister said that today was the beginning of a new era for Greek tourism and that this era has the personal ‘stamp of approval’ of Prime Minister Kostas Karamanlis. He then presented the new logo that would accompany all tourism promotion activities and the new television spot created. The new television spot was extremely well done and gave one the impression of a modern country with high ideals and a rich, highly intellectual culture. With futuristic style through the use of modern technology, the spot embedded culture and sport -including the final Euro 2000 goal- within a country with golden sun and blue seas. After the spot presentation, the minister showed shots of how the Hellenic Tourism Organization offices at home and abroad would be reconstructed. The new style gives the impression of a well organized and modern country – all offices get modern furniture and multimedia desks for visitors. “The lack of time and money for 2004 has forced us into this communication initiative so as Greek tourism can be a brand on its own, and front a technological presence during the Athens 2004 Olympic Games, the world’s biggest celebration,” said the minister. As well, he said the ministry’s basic aim is to link tourism with the Games, which is something the country has failed to do up until now. As well, he said the budget for the promotion of Greek tourism will increase steadily over the next years until it reaches somewhere around 80 million euros annually. For the 2004-2005 period, the budget is set at around 29.3 million euros, as against thee 7.9 million euros spend on promotion for the 2003-2004 period. He stressed the importance of turning Greece into a center of cultural thought. He also noted that the newly founded tourism ministry is focusing on three key issues: environment, development and culture. In the global world, Mr. Avramopoulos said, it is crucial for citizens to have access to a network of information on cultures. The minister then presented the Olympic Stand of Greek Tourism within Zappeio, which includes the ministry’s modern tourism stand, complete with multimedia, and a stand on Ancient Olympia created by the ministry in cooperation with the World Union of Olympic Cities.